Upon arrival at the dungeon, the depths of which we were to clean out in hopes of becoming more experienced at this sort of thing and finding more powerful weapons and artifacts so that we could go on to repeat this sort of quest in another dungeon… No, no, no, that’s not the way it happened. Shall I start again? When we got to the chocolate museum, I was impressed by the volcanic rock façade of the building, but then noticed that the cacao trees were few in number and located inside a special greenhouse. 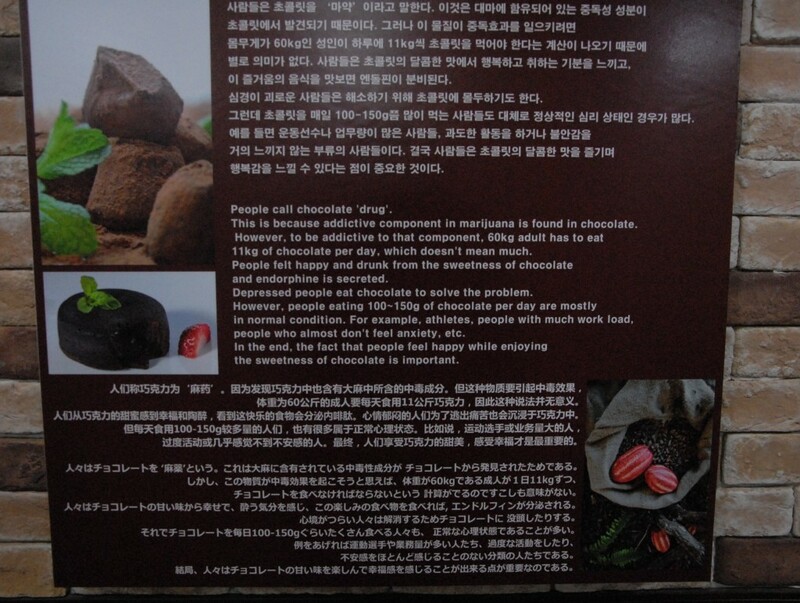 It wasn’t until we had started wandering through the museum, though, that it was confirmed that cacao growing and/or chocolate making were not things for which Jeju was renowned. Unlike, say, parts of the Caribbean for the former or Switzerland for the latter. Oh well, I did learn some interesting things. Does this mean chocolate should be an illegal substance? I don’t really know what to think of that… Aside from the fact that some places in Korea could use to hire good editors. We also learned that when Spain came to the Americas, it had great anvitions, But these anvitions were not to be, as other nations also colonized the New World. Spain’s anvitions related to chocolate thus withered away. In any case, the chocolate they sold was much too rich for our wallets, though we did get to taste a sample. While it was a decent stop (and informative), our time in Jeju would probably have been better served visiting something more related to the island. At least we’ll know for if we ever go back! Our taxi ride back was not as enjoyable because the driver was not so talkative. And his GPS unit was issuing a near constant stream of complaints at him driving faster than the speed limit. We parted ways at the Jeju World Cup stadium and had lunch at the convieniently located E-Mart, which also happened to sell less expensive chocolates–one of which had some sort of cactus jelly filling (which we, of course, bought). Our next stop was the seashell museum on the western side of Seogwipo city. We enjoyed this museum much more than the chocolate museum. For one, there were many shells displayed that came from Jeju, giving it a local feeling. And the shells were displayed rather artfully, which made it aesthetically pleasing. Finally, there was a decent view of the surrounding area from the roof garden. I would definitely return! We wandered alongside a park, down a long stairway, past an old grave, and on a road to get to Cheonjiyeon waterfall. The waterfall itself was located not too far from where we had started walking, but you could only access the viewing area from downstream and at the bottom of the bluffs, rather than the top. The stream up to the waterfall had some artificial waterfalls created by dams disguised as natural rocks on the front side. Yeah… sometimes it gets hard to tell what is and isn’t natural here in Korea. The pool at the base of the waterfall was a relaxing place. Remember the island and bridge I talked about previously? Well, my wife and I returned there and walked on the trail leading around the island. It was nice to be able to look inland and not see any buildings! Of course, there were lights in the ground along the trail, but it was one of the few times I’ve actually felt like I might be in a natural place in Korea. Perhaps it’s because I’ve been living in a rather developed province and not one of the more agricultural ones, but it just feels so built up here in Korea, so it was pleasant to have the momentary illusion of being in a more wild area. Needless to say, I walked slowly through there. And before I forget, the bridge is supposed to resemble a sailboat–just check out the picture below. Our dinner was sausages in a cafe. Rather delicious. And a rather enjoyable Christmas day! Exterior of the chocolate musueum. Several of the seashell displays. Cheonjiyeon waterfall and resultant photographers. My lovely wife with Seogwipo harbor and city in the background.